Mailstyler can work with images from any source. Even large pictures can be resized thanks to his smart and intuitive crop&resize internal tool; they will fit perfectly into the message without having to use an external software like Photoshop. Images get also compressed in order to weigh as little as possible, fundamental requirement for email messages. With MailStyler you can choose to create email responsive and 100% compatible. Mobiles, tablets or desktops: it does not matter where opened, your email will always be easy to read by maintaining a perfect rendering. In this way you can be sure to reach a wider audience and get more clicks. Our drag&drop editor is fully based on the interaction visual, and requires no HTML knowledge, but it maintains the flexibility and endless customization properties of a professional tool. Create your own personal templates easily and without having to write a single line of code. Every newsletter created with MailStyler get tested in order to be displayed properly by any Email Client. We follow all the innovations introduced by the various email client services and verify the results with tools such Litmus and EmailOnAcid (professional rendering email testing programs) to ensure emails correctly displayed: always and anywhere. MailStyler offers a WYSIWYG, drag and drop email editor which is so simple and intuitive that it’s impossible to make it wrong. Worried by email rendering issues? 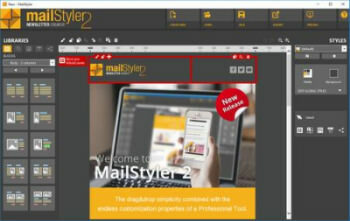 With MailStyler, all templates will look perfect on any clients or webmails (e.g. Hotmail, Gmail, Outlook, Yahoo Mail etc). That’s why you don’t need to code in HTML/CSS. MailStyler lets you create emails and newsletters without any coding. You will simply combine our pre-made HTML blocks as you wish, building your newsletter brick by brick. The range of tweaks that you can do with MailStyler is huge, and far beyond any competitors: size, styles, margins, fonts, boxes, images. Anything can be modified in a few clicks, to build a truly unique layout that fits your brand identity. MailStyler comes with a library of 2000+ images to enhance your creativity and help you compose an original design. The Pro version of MailStyler offers a dedicated cloud space where to put and manage your images, and forget once for all any FTP uploading issues. Need to fit an uploaded image to a newly adapted box? With our resizing/cropping tool it’s a matter of seconds. No more stretched pictures! For a newsletter that renders perfectly on smartphones and tablets, we provide responsive blocks that will automatically resize if opened on a mobile device. To offer the best readability also on small screens. MailStyler provides a tuned color palette with different balance of shades, to help you determine the best outfit for your email. Once finished your design, you can export it as an .eml or .html literally with one click and use it on any professional marketing software products, services and clients.